As the barbarians continue their steady progression toward the Eternal City, the Roman legion confidently marches forth to protect their home and defend the empire. 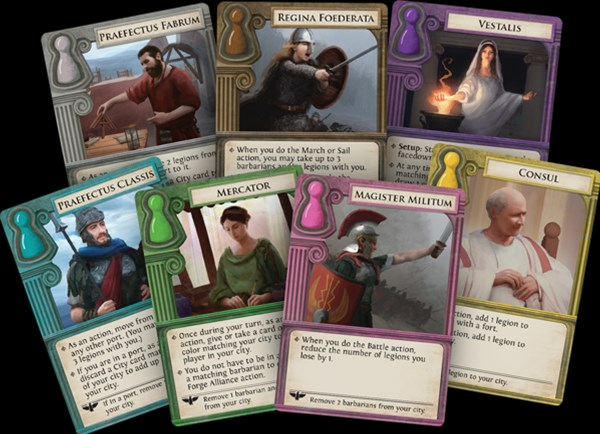 In Pandemic: Fall of Rome, players will use the legion to battle against the barbarians, rolling battle dice to determine the outcome. While at least one legion and one barbarian are in your city, you can choose to battle. The battle dice have five different symbols (one symbol appears twice) that will determine the outcome of the battle. Roll up to one battle die for each legion in your city, using a maximum of three dice. If the battle is successful, you can choose to remove any combination of barbarians in the city, but you must remove as many as possible. For example, Sophie has moved into Carnuntum with two legions. Two of the barbarian tribes have progressed and invaded that city. There are two green cubes (Huns) and one blue cube (Ostrogoth) in the city. Because Sophie has two legions with her, she can roll one or two dice to battle the barbarians. She wants to maximize her chances of removing barbarians, so she rolls two dice. She rolls a total of two legion icons and four barbarian icons, so she removes two legions and three barbarians.